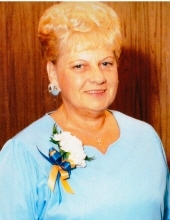 Shirley A. Calabretta, 85, of Fairview Twp., Etters, died Thursday, April 4, 2019, at Holy Spirit Hospital, East Pennsboro Twp. She retired as a Supervisor for the Dept. of Revenue Office, Harrisburg. Shirley was a member of American Legion Post 143 Auxiliary, New Cumberland, enjoyed playing cards, loved animals and was an avid traveler. Born in New Cumberland on February 26, 1934, she was the daughter of Irvin and Erma Tarman. She was also preceded in death by a brother, Richard Tarman. Surviving are two daughters, Sharon L. Rapak of Etters and Serena J. Arnold (William) of Inverness, FL; two grandchildren, Kristi M. Foley and Kelli L. Tweddale; two great grandchildren, Kaitlin and Scarlett. In lieu of flowers, memorial contributions are requested to the Humane Society of Harrisburg Area (www.humanesocietyhbg.org), 7790 Grayson Rd, Harrisburg, PA 17111. To send messages of condolence, please visit www.parthemore.com. To send flowers or a remembrance gift to the family of Shirley A. Calabretta, please visit our Tribute Store. "Email Address" would like to share the life celebration of Shirley A. Calabretta. Click on the "link" to go to share a favorite memory or leave a condolence message for the family.